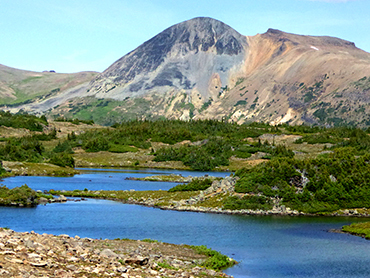 Located in the west-central region of the province, the West Chilcotin is home to a wide variety of wildlife and birds. 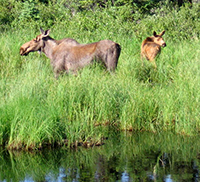 The country is very favorable for moose, which like to feed in meadows bordered with a cover of red willow or 'buckbrush' as well as in shallow ponds and lakes supporting underwater tubers and grasses. Though normally a very shy animal, there has been a marked increase in sightings due to population relocation because of regional forest fires. 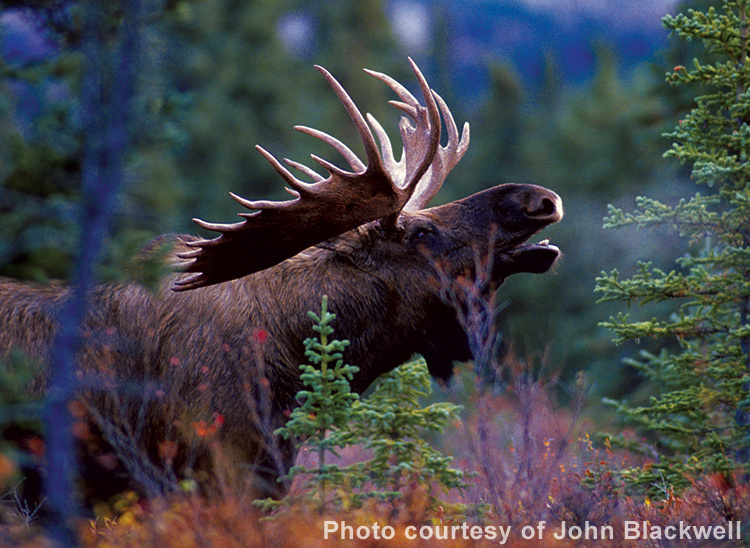 This region also has the largest population of Woodland Caribou in British Columbia. Strict management practices have allowed the herds to grow adequately enough to support limited hunting, as well as allow other management areas in B.C. to take some of the breeding cows and restock their regions. Although most of the herds are in high alpine in summer, many move down to the lower valleys or meadows in winter where they are harassed less by wolf packs. Besides Caribou, this area supports a large population of Mule deer locally and some Whitetail further to the east. Located in the west-central region of the province, Tweedsmuir Park is 480 km northwest of Vancouver as the crow flies. The Park boundary starts just a few miles to the west of Anahim and Nimpo Lakes. Tweedsmuir Park is considered an isolated wilderness and should be treated as such. Both grizzly and black bear are fairly common on the Chilcotin Plateau, but probably not as much as in the Park, only because the Salmon runs are such a huge draw for the bears. As with any wilderness park, care and caution should always be taken when fishing or hiking. 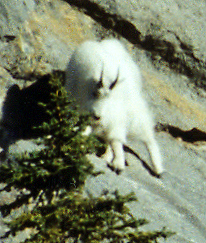 You will also find Mountain Goat in the mountains of the park, as well as in the mountains bordering the plateau. There are Timber Wolves in the region but they tend to stay a little higher up in the alpine, although on occassion you will see them cross the local lakes in winter. Coyote, Fox and Lynx are very common in the area, as are many fur bearing animals such as mink, and otter. Less common, but seen on the rare occasion, are Cougar and Wolverine. Cougar are far more common in the Tatla and Tatlayoko area where there is a very high deer population. 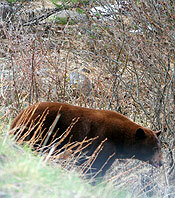 The West Chilcotin has one of the largest Grizzly populations in Canada as well as a huge Black Bear population. Lonesome Lake in Tweedsmuir Park is the home of the Trumpeter Swans made famous by Ralph Edwards in the book "Crusoe of Lonesome Lake." It is the true tale of a man who very nearly single handedly brought the Trumpeter Swan back from extinction in Canada. There is nothing more fascinating than watching the swans arrive to do their mating dance on local lakes before the ice is even off, prior to flying home to the Lonesome Lake valley. Anahim Lake is home to a large, protected colony of Pelicans that have been successfully increasing in numbers for some years now as well. This region is home to many birds of prey, including hawks and owls, but for a treat, look to the skies to see nesting pairs of Bald Eagles soaring high overhead. This huge bird of prey is common in the region. Unfortunately, it is the bane of one of our most popular birds, the Loon. The male Loon often arrives to the regions lakes before ice off, and you'll hear his lonely cry for a week or two prior to the arrival of his mate. A powerful bird, battling males or a male protecting his nest, mate or territory will often chase each other on the water at full speed with wings flapping at the water for forward speed for up to half an hour! Probably the equivalent of a man running full speed up hill with weights tied to each ankle; it is a fascinating sight to see. The Loon's call is truly one of the haunting sounds of the wilderness, and we are blessed with a large population of this beautiful bird and so every night we are enraptured by their orchestra. Space does not permit to list all the wildlife in the area, or their antics. So come see for yourself. 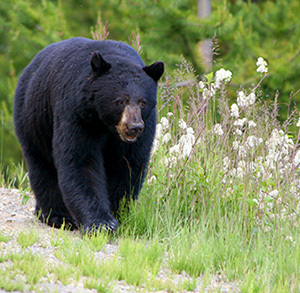 Come experience the vast nature and wide range of fascinating animals that British Columbia has to offer. And bring your camera, because this is a wildlife photographer's paradise!